The re-tooled 2018 Land Rover Discovery is full of quirks and foibles that overshadow its impressive off-road ability. The 2018 Chevrolet Traverse returns to the three-row crossover segment with improved fuel economy and a host of new standard features. The Buick Enclave Avenir was a champ on a 400-mile road trip to San Francisco with two kids and a lot of stuff. The 2018 Ford F-150 Diesel combines range and refinement on a 1,000-mile road trip as light-duty pickups embrace the fuel. A trip into the mountains in a Tesla Model X P100D proved that it’s possible to go electric in winter weather. Though long in the tooth, the 2018 Toyota Tundra brings helpful safety technology to the full-size pickup segment to endear itself to buyers. 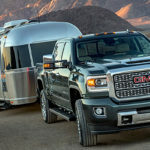 The 2018 GMC Yukon Denali combines safety tech, connectivity and comfort to create a vehicle livable enough for everyday and powerful enough to get away. A spirited drive on mountain roads highlights the sporting credentials of the Tesla Model X P100D with effortless speed and power.